I read with great interest and a touch of nostalgia, the business news’s headlines that Bill Gates is no longer the richest man in the world; he has been dethroned by Carlos Slim. Carlos Slim’s total worth reportedly now stands at about $62.9 billion; Bill Gates is only worth about $59.2 billion. For Slim, a onetime math instructor, this was no mere academic exercise. Yes, he wanted to instill in his sons the same lesson his father – a Lebanese immigrant who started acquiring real estate in during the Revolution of 1910 – taught him: Though Mexico will have its ups and downs, don’t ever count the country out. But Slim wasn’t just teaching, he was buying. He spent $55 million on an Insurance Company. He took a stake in retailer Sanborns. He invested in a hotel chain. Though he taught math to make money in college, Slim graduated with a degree in engineering from the National Autonomous University of Mexico in the early 1960s. He then started a stock brokerage in and began to acquire industrial companies he deemed bargains. He would reinvest the cash from those businesses or use it to acquire additional properties. After 13 years as the world’s richest person, Bill Gates appears to have been dethroned. But there will probably be no sobbing inside his estate. The main reason: a 27 percent surge in the stock price of Slim’s wireless company, America Movil, in the second quarter. With nearly US$60b, Mexican telecoms tycoon Carlos Slim has overtaken Microsoft founder Bill Gates for the title of the world’s richest person, Fortune magazine reports in its latest edition. At a Microsoft conference in Redmond last year, advertising executive and TV host Donny Deutsch asked Gates if he would be upset if someday he were no longer the world’s richest man. “I wish I wasn’t,” Gates replied. “There’s nothing good that comes out of that.” Mr. Gates has headed the Forbes list of the worlds wealthiest for more than a decade. But, like Mr. Buffett, he is rapidly becoming as well known for giving his money away as he is for accumulating it. Slim’s ascendancy to the top of the world’s financial pyramid bumps Berkshire Hathaway whiz Warren Buffet to third place. Next story Should Schools have Money Management Classes? Previous story Entrepreneurs: Born or Made. Does it matter? You are right the picture says it all…lol. I am personally a fan of Bill when it comes to his spendings on charitable causes and his achievements. Take care and cheers sweety. Bill G. gave away much of his wealth for charity right? That’s part of the equation. As my old dad would say: they couldn’t shovel the money they earn into cloth sacks as fast as they’re earning it. The money these people earn is just worthless to them. I’m not advocating some communist ideals here, what I am saying is that at a certain threshold, the money a person acquires goes beyond mere wealth, ascends beyond power and becomes a meaningless string of digits. These people should feel morally compelled to redistribute their wealth to those that would best benefit from what is to these guys, nothing. I know that Bill Gates and his wife run a foundation which is using his hideously vast fortune to help people in developing nations. You are right on part of the equation mate, Bill did give a lot to charity. I remember back before the Dot Com crash, there was a lot of talk that Gates was on hos way to becoming the first trillionaire. That’ll be an interesting day when someone cracks that ceiling. Thanks for your visit and comment. Yeah a lot of people who have lots more than they need and should help the less fortunate, for a noble cause. Bill gave away lots of his wealth to charity and thats appreciable. 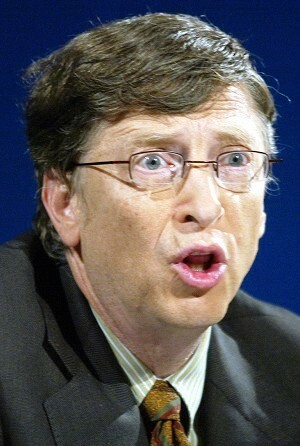 wish mr. bill gates give me donations for my poorest relatives in the world. i see it as an opertunity for him to use his money more freely and not have to worry about being the richest anymore. Bill gates is american, no matter the case better then that mexican. dude stop hating on carlos slim just because his mexican…his the most richest person in the world of course..and he does donate alot of money to people..
slim is mexican he has done more for his nation than bill gates times 1000000 he donates money for surgery for schools and much more. the mexican people admire him for that. he isnt some stuck up wall street to-good-for-you person. he once donated 100,000 computers to schools in mexico. he seems like the only one who cares about the poor in mexico. since when do you see images of starving mexican kids on the tv??? never!! !because america is a rascist country. carlos slim is a legend!